Through all the shrieking propaganda, through all the screaming lies and slander, a few sober and moderated voices on the Left are finally being raised. The grand Democrat design of demonizing critics of the Obama oligarchy may be backfiring big time. The Chicago thuggery that has gone hand-in-hand with all the blatant Alinsky chicanery may now be seen by some liberal talking heads as going a bridge too far. NPR’s Juan Williams wrote an opinion piece in the Wall Street Journal on Friday castigating the Democrats for creating a race rodeo in their attempt to discredit Tea Party adherents. …Opposition to health-care reform from the tea party is not based on racism but self-interest…Tea party activists are surprisingly mainstream when it comes to their grievances about politics. They fit right in with most American voters who tell pollsters the country has been headed in the wrong direction under both Presidents Bush and Obama…Whether you like them or not they do seem to have captured the political angst in the electorate, without regard to skin color. And in today’s Christian Science Monitor, staff writer, Patrik Jonsson declared that contrary to the crazy caricature of the angry white man with racist tendencies perpetrated by the Democrats, Tea Party activists are actually more mainstream and decidedly more female. Commenting on the Contract from America Project, the Christian Science Monitor seemed impressed that the ‘sign-wielding protesters’ were maturing into a genuine reform movement. The release of the top three Tea Party issues this week gives a glimpse of a small-government movement, growing, maturing, and looking increasingly like middle America. 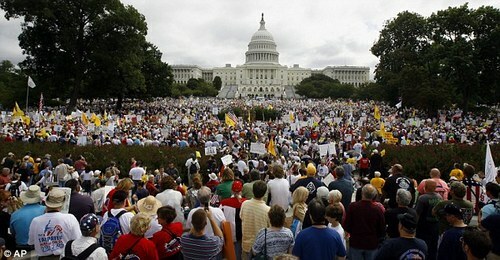 The Tea Party as Middle America. Well, that’s no news to us. But apparently it’s a recent revelation for some of those self-appointed chatterboxes opining within the hollow halls of journalistic jingoism. The political realities are surfacing and even the Obama true believers are taking note. This entry was posted in Political/Social and tagged Alinsky, big government, Chrisitan Science Monitor, Contract from America, healthcare, Juan Williams, mainstream, NPR, obama, Tea Party. Bookmark the permalink. Jingoism “extreme nationalism chatcterized by a belligernt foreign policy.” You made me learn something. Thanks. Well, I tried to enter the 21st century and put something on facebook. If you are a member,look up Glen A. Amos in Auburn, CA. I actually answered the questions candidly. Having been a salesman for 35 years, that goes against a lifetime of training. I’m on Twitter but not Facebook. Maybe that’s my next stop. I have not looked up “jingoism” but I will. I did recognize “oligarchy” and “Alinsky.” I just love reading you. I could do a couple paragraphs on Juan Williams, but will spare you. You made me laugh out loud, Glen. And I enjoy your comments. Keep em up. Huge numbers of average good-natured hard-working freedom-loving Americans make up the Tea Party movement, and it can’t be concealed, even by a deceitful MSM. When the supposedly “objective” media intentionally mischaracterize and attack ordinary citizens, the backlash promises to be huge. I agree. The more they dismiss us and demonize us, the bigger the backlash. The MSM is in for a bumpy ride.